There’s a chill in the air as Autumn returns to close out yet another year. It is a welcome retreat from the scorching hot summer, as refreshing to the senses as the arrival of a sweet frozen dessert. Fieldstone Bakery’s Original Premium Granola is the key to a great fall parfait. When we think of fall, we instantly imagine the taste and the sight of pumpkin. Not only is it a festive ingredient for the season (a plus when serving to guests), but pumpkin is also low in calories, high in fiber, and rich in antioxidants and vitamins. 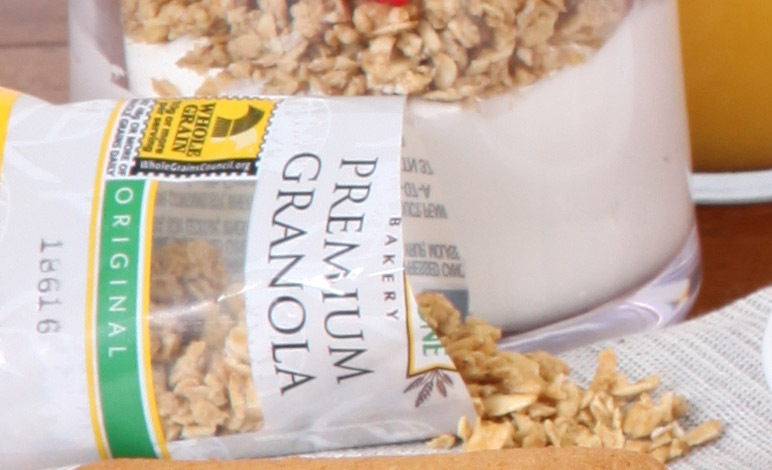 ½ to 1 cup of Fieldstone Bakery’s Original Premium Granola (available in 0.6 oz, 1 oz, 2 oz, and 12 lb., 8 oz. Combine ingredients except for the granola and stir together to give it a distinct taste. Start with a layer of pumpkin yogurt mixture at the bottom of the glass and then alternate layers of granola on top of yogurt, stacking as you build to the top of the glass. For best results, assemble right before serving. Another great breakfast treat incorporates sautéed apples cooked in a large non-stick skillet with melted butter and lemon juice. Saute the diced apples for about 5 minutes, sprinkling ½ teaspoon of cinnamon or 2 teaspoons of sugar. Cook for a total of about 10 minutes, then assemble the parfait with alternating layers of yogurt and granola, topped with a combination of granola and the sautéed spiced apples. We hope you enjoy these sweet, frosty treats, enhanced by the crunchy goodness of Fieldstone Bakery’s Original Premium Granola.